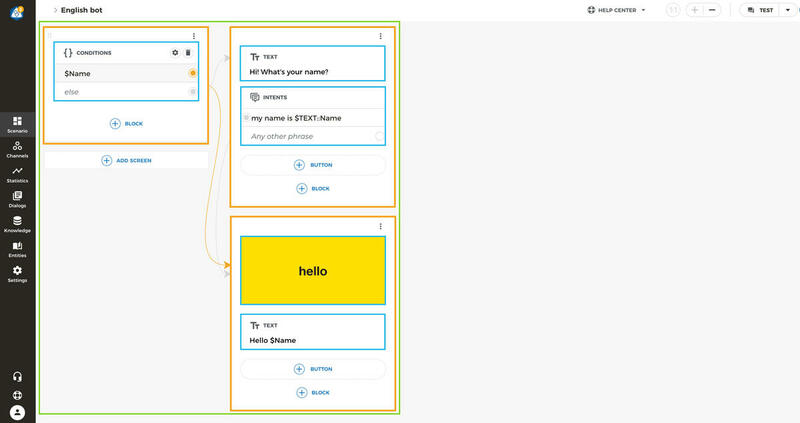 Aimylogic is a visual tool for intelligent chatbots and conversational UI development. "Intelligent" means that such chatbots and voice applications can understand your clients fluently, thanks to Aimylogic&apos;s Natural Language Processing technology. Aimylogic doesn&apos;t require you to have programming skills because it provides a great visual editor where you can drag&apos;n&apos;drop functional blocks of your chatbot and connect each other to build a conversational user interface. Thus it&apos;s easy to design and manage non-linear dialog scenarios for chatbots as well as voice driven applications and skills for voice assistants. With Aimylogic you can easily create and manage conversational chatbots and voice apps. We use the word "bot" for this. In this simple example: first of all bot checks if it already knows the user&apos;s name (the first screen with Conditions block). If it doesn&apos;t - then bot jumps to the second screen (with Text and Intents blocks). If it knows - then it jumps to the third screen (with Image and Text). Each bot in Aimylogic contains at least one scenario - the logic of conversation between the bot and the user. Each scenario of the bot contains a collection of screens - the bot&apos;s states. During it&apos;s work the bot jumps from one screen to another. Each screen can generate some output for the user and await some user&apos;s reactions - like click on the button or text/voice input. All screens are connected by connections. All together they design the entire bot&apos;s scenario. Each screen contains at least one block - a functional unit of the bot. Block performs some action - like generation of the text output, HTTP request to external web service or something else. Some of these blocks have transition points - to connect one screen with other. Once your bot is ready you have to connect it to one or more channels. Aimylogic is an omni-channel solution, thus your bot can work simultaneously in a Telegram chat, as Amazon Alexa skill, Google Home action and Facebook&apos;s chatbot. Once the user activates your bot (clicks start button in Telegram or invokes the Alexa&apos;s skill by name) it jumps to the first screen in main scenario. Then it executes blocks on this screen one by one, generating some outputs, calculating conditions, sending HTTP requests and jumping over screens. This process continues until the next block requires the user type or say anything. Then the bot generates all collected output to the channel and awaits for the user&apos;s input (text or voice). Once the user says or types something, the bot matches the input query with current state and decides about the next screen to go. And the entire process repeats again.